Royal Purple Smokebush has beautiful, velvety, dark purple leaves throughout the growing season. The blooms are panicles of smoky-purple to beige flowers which bloom in mid-summer. 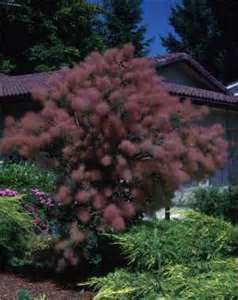 This gives the effect of a cloud of smoke, giving it the name of 'Smoke Bush'. Plant this shrub in partial shade for greener leaves or full sun for the deep burgundy leaves. It will grow to a height of 8' to 10' tall and 8' to 10' wide. You can train this shrub to form a patio tree if desired. Use Royal Purple Smoke Bush as a specimen, in a shrub border, as an accent plant, or as a patio tree. It is drought tolerant once it is established and makes an excellent xeriscaping plant. It is also deer resistant.